South Africans celebrated the 60th anniversary of National Women’s Day Tuesday, commemorating the day in 1956 when an estimated 20,000 South African women of different ethnic backgrounds marched on the Union Buildings in Pretoria to protest against repressive Apartheid laws. In 1956, under the government of Prime Minister J.G. Strijdom, parliament passed a law requiring all Black South Africans to carry an internal passport at all times. The law, which was officially known as the Population Registration Act and more commonly referred to as “pass laws,” was meant to institutionalize discrimination and racial segregation while maintaining strict control of the urbanization rate and the movement of migrant labour. 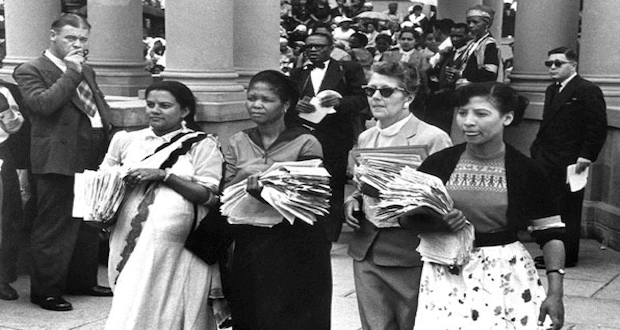 The August 1956 Women’s March featured women of all races and was led by Sophia Williams De-Bruyn, Lilian Ngoyi, Helen Joseph, and Rahima Moosa. The women left bundles of petitions with more than 100,000 signatories at the office doors of Prime Minister Strijdom. Afterward, the majority of them — in their traditional dress — stood in complete silence for some 30 minutes before breaking in to a protest song specifically composed for the occasion. A particular line from the song, “Wathint’ Abafazi Wathint’ imbokodo!” (“Now you have touched the women, you have struck a rock!”) went on to become a popular maxim in South Africa. Throughout the protests, the huge crowd of women were reported to have maintained a level of discipline and fortitude unusual for a gathering of that size. The 2016 celebrations of the National Women’s Day is a landmark occasion, marking the 60th anniversary of the women’s march. It is also a public holiday. South Africa’s President Jacob Zuma delivered a key note address to recognize the role of women in the anti-Apartheid struggle. The first anniversary of the South African National Women’s Day was celebrated in 1995, a year after South Africa’s first free and fair elections brought Nelson Mandela in to power. The month of August is also now regarded as Women’s Month in South Africa.